Microprocessor crystal oscillators are a convenient and inexpensive way to obtain a relatively stable, clean and acurate frequency source. At least, they were until recently. With the explosion in this market, necessary to support the ever expanding reach of microcontrollers, crystal oscillator manufacturers had to find a way to serve their market faster and cheaper. So they invented the Programmable Crystal Oscillator. Now, you can get just about any frequency between 1 and 100 MHz overnight from the larger distributors such as Digikey and Avnet, with typical "cheap crystal" precision, temperature and aging characteristics. These oscillators, such as the Epson SG-8002 series, are actually mini-synthesizers. Using a single crystal, a VCO, programmable dividers and appropriate memory and control circuits, the distributor can easily program a standard part to your frequency, the settings are saved in non-volatile memory and Voila! There are a couple of issues with this system. The manufacturer does not release programming information, so you cannot stock the unprogrammed part yourself, only the distributors have the programmer. This is not a real problem, as the parts are inexpensive even in small quantities, and the distributors usually have stock. The synthesizer has to be small, inexpensive and cover a wide band, therefore it is noisy, usually too noisy for anything but a microprocessor clock application. For instance, they would be too noisy for just about any communication application. To illustrate the point, here are plots of conventional microprocessor crystal oscillators, and a plot of an Epson SG-8002 device. Judge for yourself. Note: I believe the Epson SG-8002 series is actually cleaner than some other brands, the problem is that phase noise performance is not stated on the data sheet, so you have to try the parts to know if you can use them, and what you get today may not be the same as what you will get next week, next month or next year. 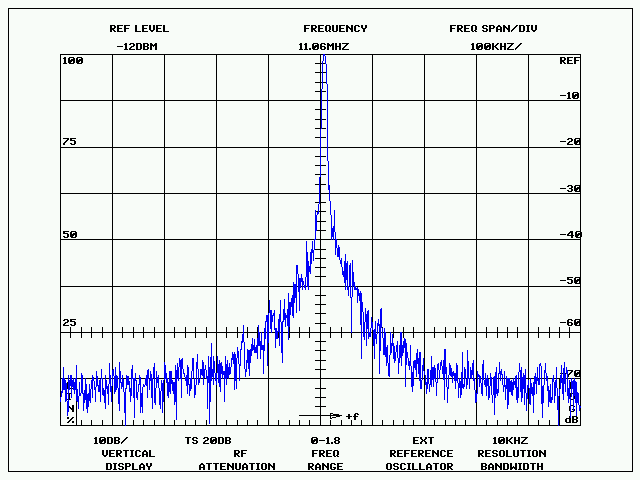 This is a plot of an Epson SG-531P running at 4MHz. The SG-531P is a conventional crystal oscillator (not synthesized). 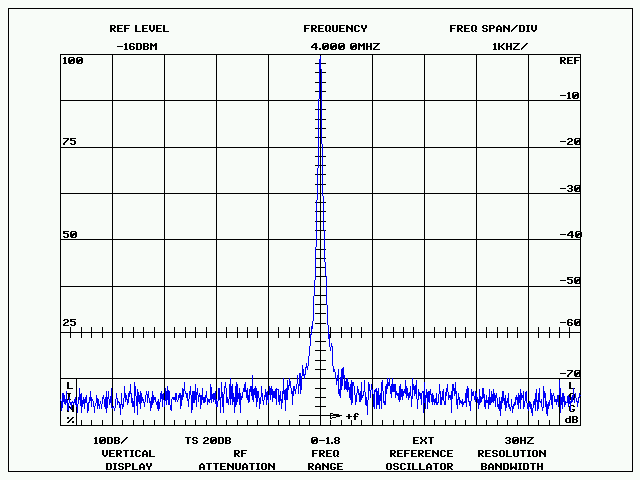 This is a plot of a CTS MX045 running at 64 MHz. 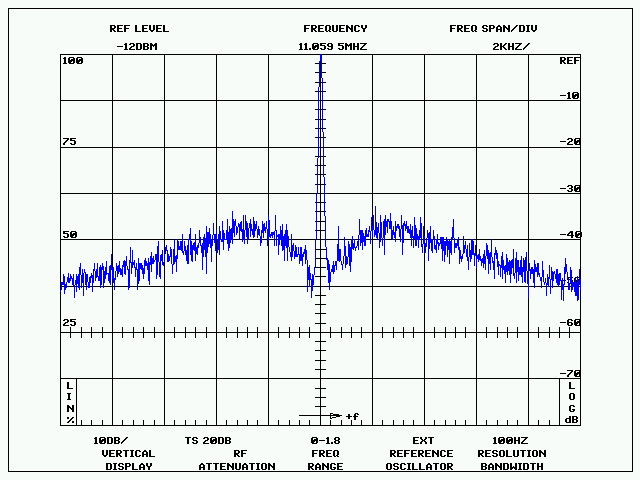 This is a plot of an Epson SG-8002 at 11.059 MHz, narrow band. It looks like the PLL bandwidth is about 2 kHz. 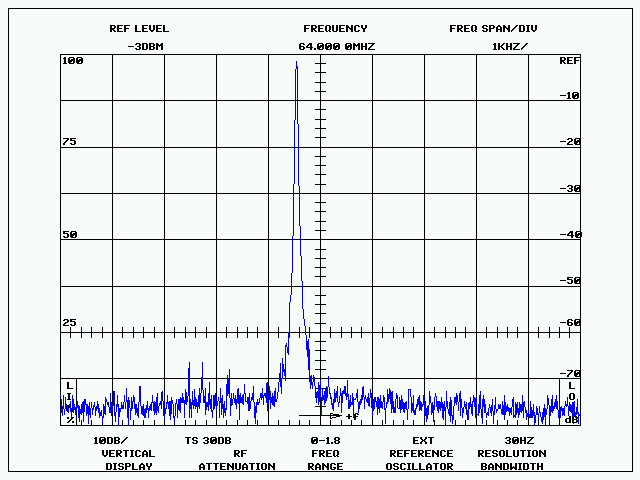 This is a plot of an Epson SG-8002 at 11.059 MHz, wide band.